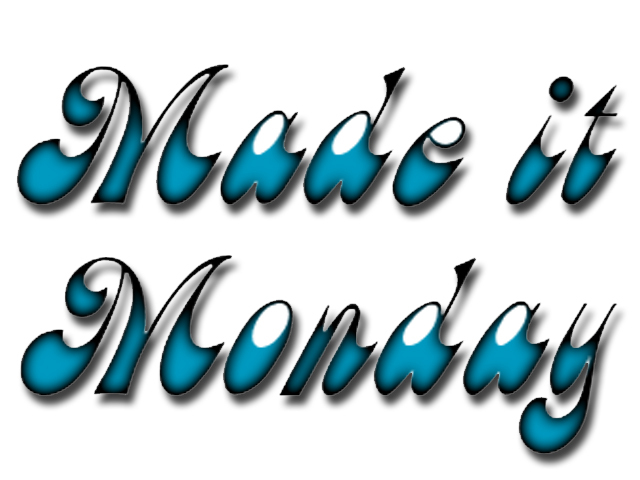 Crafty Girl Squared: Another Made it Monday! Hey everyone! It's time for another Made it Monday! Today I'm going to show off some projects I completed this past week. I've been a busy bee trying to get lots of things done for deadlines and couldn't be more excited about the things I have to show you! Doesn't he look handsome?! :) He's going to wear it this weekend while he hangs out at Aunt Mary and Uncle Ted's house with his puppy bff Daisy. I, on the other hand, get to GO to the Browns v. Colts game! Yay! My sewing machine broke in the midst of sewing this beauty, but fear not - I have good friends with functioning sewing machines who are always willing to lend me theirs when I'm in need. Raj and I packed up our stuff and went over to Aunt Lissa and Uncle Ray's house to finish it up. I also finished the cushions I was making for my friends' window seats while I was there! This last project I'm showing you will soon be up for sale in our Etsy shop! I crocheted this while I was kid-sitting this week. I am hoping to get a few more done (and maybe one for me!) and put them in the shop this week. They're super quick to work up, but the stitch is really fun. They're warm, very versatile, and I love every one of them! So, there you have it! This is what I was up to this week. What were you up to this week? Linking up at Etcetorize today!